PORT HARCOURT – Rivers state chapter of the Peoples Democratic Party, PDP has called on the Minister of Transportation, Mr Chibuike Amaechi to resign his position, saying he had no moral basis to remain in office after the allegations of bribery leveled against him by two judges. In a statement Sunday, Chairman of the party, Mr Felix Obuah called on the Minister to step aside to allow for thorough investigation of the allegations, adding that President Muhammadu Buhari should relieve him of his appointment as Minister in hishis cabinet. “To further prove his innocence of the various allegations, Mr. Amaechi should resign, cooperate and allow the process of his investigation by not sabotaging any of such efforts in getting to the truth. Amaechi and Justice Ngwuta The revelations have vindicated the PDP in Rivers State, as it has consistently complained about the corrupt and undemocratic dispositions of …and some of his APC folks. 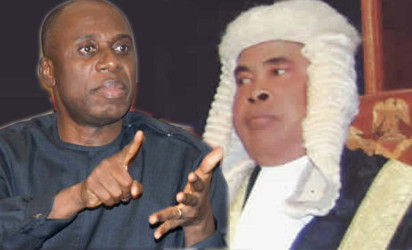 We demand thorough investigation into these stunning revelations by these honouable Justices of the Supreme Court and call on the accused (Amaechi) to resign immediately, as he lacks the moral rectitude to remain in office as a public servant, Meantime, the All Progressive Congress, APC, in the state, has dismissed the allegations by the Judges against Amaechi as laughable, saying they were part of ploy by those not happy with the role Amaechi played to dislodge the PDP at the centre to destroy him. Media aide to the Chairman, Chief Eze Chukwuemeka described the allegations by the judges as baseless and unfounded. ” I consider PDP’s suggestion that Amaechi should resign because two drowning Justices are looking for a tool to stay afloat as not only laughable, mischievous but exposure of a group that so desperate to expose their evil plots against a man whom they see as the arrowhead that dislodged them from power at the centre. These useless calls based on the unfounded and baseless attempted bribery allegations against the former Rivers State Governor confirms our fears and stand that the two discredited Justices made these allegations as part of a political strategy to run down the political fortunes of this rising star. PDP is only acting out its frustration over the key role that Amaechi played to end the corruption system engineered by the past PDP administration at the centre,” Rivers APC said.